Well, we’ve come to the end of another great give away. This time around it was for the Custom 77 King for a Day Booster. Custom 77, out of France, are making some amazing pedals (guitars, amps and more) and sent over a couple of their pedals for us to demo. The King for a Day Booster is a classic treble booster in the same vein as the Dallas Rangemaster, etc. This is a great pedal for leads or giving a little top end bite to your rhythm. A really great pedal for sure! 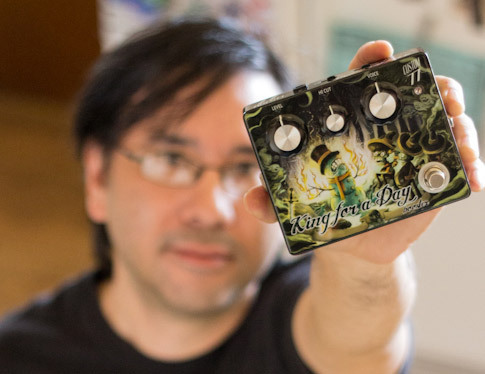 To learn more about the King for a Day booster, please check out the demo post – “Custom 77 King for a Day Booster Demo“. Also, be sure to check out Custom 77 on the web, follow them on Twitter and like their page on Facebook to see what else they’re up! Okay, without further ado, the winner of the Custom 77 King for a Day Booster is Michael Perkins of Phoenix, Arizona! Congratulations Michael! The pedal will ship out tomorrow. Please let us know what you think of this great pedal! I’ll be posting an interesting give away very soon. I think you guys will definitely be into this pedal for sure (because you’ll be customizing it!). So keep an eye out for this next give away!